In the aftermath of NHLer Rick Rypien's tragic death, Scott Burnside writes, "This is what we do in the face of unexplained tragedy. We ask questions for which there are precious few answers. We demand change and action without really understanding what it was that led to the tragedy in the first place. We wonder at what might have been done differently, what signs might have been missed." Mental health issues are so difficult to admit, get help for and be understood by others. So tragic! 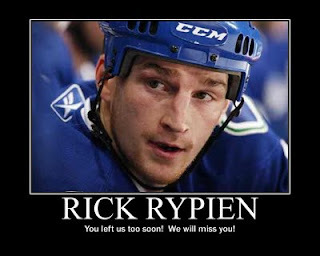 Please keep Rick Rypien's family in your prayers! I pray that the stigma attached to mental illness will somehow, someday, forever be removed.